On a cold Sunday afternoon at the end of January, about 50 people gathered outside the home of John Goldsmith, retired director of the Heinz Chapel Choir, to serenade him one last time. Even in his last few days, Goldsmith could make his choir laugh. “[Goldsmith] was singing along and then he made a joke when we were finished, he was like ‘I’d like to take you guys on tour,’” Adam VanGorder, a fifth-year senior, said. The alumni and current choir members sang the very music that Goldsmith spent 25 years instilling into the hearts of generations of Pitt students, including “Brother James’s Air” and a Valentine’s song with lyrics rewritten by Goldsmith. Four days later, on Feb. 2, Goldsmith passed away at the age of 71 after a battle with cancer. From 1989 to 2014, Goldsmith was the director of the HCC. Lovingly referred to as “J.G.” by those who knew him, Goldsmith left behind a legacy of unmatched musicality and skill in the group that he spent a quarter of a century cracking jokes with, teaching and directing. Before he came to Pitt, Goldsmith graduated from Capital University in 1969 with a bachelor’s degree in music education and from Westminster Choir College in 1975 with a master’s degree in conducting. He was also a member of the Robert Shaw Festival Singers and the male choral group Chanticleer. 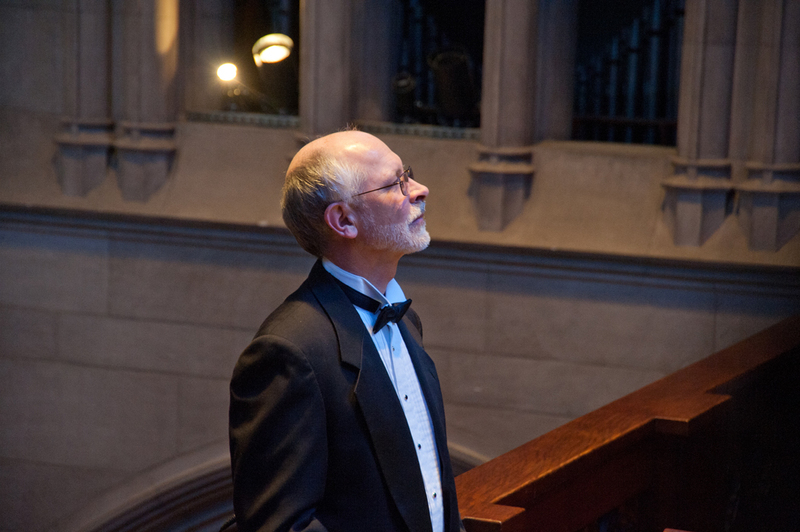 After retiring from Pitt, Goldsmith received the Pennsylvania American Choral Directors Association’s Elaine Brown Award for Choral Excellence in 2015, which recognized him for his lifelong commitment to and excellence in music. According to Adam VanGorder, a fifth-year senior who joined the choir in 2014, Goldsmith also started the High School Chamber Choir Festival to encourage high school students to come to Pitt and sing in the choir. After Goldsmith’s death, students, alumni and community members gathered at a memorial in Heinz Chapel Friday. Each pew was completely filled as loved ones took turns telling stories of their friend, some bringing the crowd to laughter, others to tears. The memorial was livestreamed on YouTube — though it’s since been removed — so that alumni who couldn’t attend could still take the time to remember their choir director. Toward the end of the memorial, all of Goldsmith’s past students were invited to the front to join the choir for a final song. Half of the people in the room rose from their seats and headed toward the altar. Again, the choir sang together, just as they did a few days before Goldsmith’s death. Brian Urbaniak, a fifth-year senior who joined the HCC as a first-year student and witnessed Goldsmith’s final directorial years, sang alongside three other members of the choir on that cold day in January. During his time as his director, Goldsmith took the HCC on tour around the world. Urbaniak went on one of those tours in 2014 — a two-week tour through the Balkans Region, with stops in Bulgaria, Albania, Bosnia, Croatia, Macedonia and Montenegro. It was the first time Urbaniak had been to Europe, just as it was for most of the other choir members. Stefan Poost, a fifth-year senior, joined the HCC as a sophomore during Goldsmith’s last year as director. Despite his talent as a director, Goldsmith kept rehearsals interesting and upbeat, according to Poost. Even choir members who knew Goldsmith for a short period of time said that he made a large impact on them, particularly since Goldsmith knew “every single person” in the choir, according to VanGorder. Goldsmith’s dedication to his work and his students allowed him to craft a choir that included students with nontraditional musical education — causing Goldsmith’s impact to reach nearly as far as the countries his choir toured.